Several weeks ago our new neighbors moved a playhouse into the space between our houses. They intend to move it into the backyard but need to remove the fence and rent a forklift. It’s an adorable little house. One morning as I was loading my things into the car to go to work, an older couple was standing in the neighbor’s yard admiring the house. They asked me if the neighbors were selling it. Now there is a real estate agent in town who shares my name and I have actually taken her phone calls in the past. I, however, am not interested in taking her job. I explained that the neighbors had recently moved in, have five children and were probably still asleep, but I would check with them later. 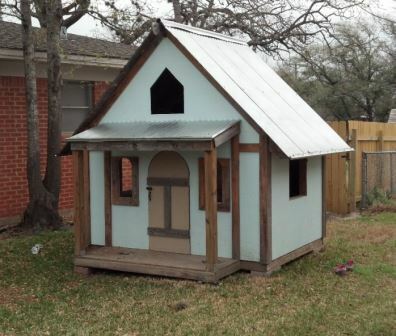 The couple had retired and wanted a play house for their grandchildren. I wished them luck and went on to my real job – teaching music. The house has been there for about three weeks now. It isn’t bothering me and there have been no more sales offers. Bella, our dachshund with short-term memory issues, continues to bark at it every time she goes outside. And every time I explain to her that it is the same house that has been there and barking will not make it go away. I used to think it took a lot of patience to deal with children. Now I realize that dogs are much more challenging. Thanks for not selling the playhouse ;). Ya’ll are great neighbors! You’re welcome 🙂 We appreciate having neighbors who like chickens.